5. Use results to guide appropriate and successful management in different types of systems with different sources of nutrients and different uses. The agencies which make the project team are' SOA, FIO, SIO, TIO, Ningbo University, NOAA IMAR and PML. Support is additionally provided by the EU through the SPEAR project and Erasmus Mundus. The proposed workplan is divided into four sections. Firstly, an overall listing of Chinese coastal systems will be carried out, providing basic descriptive data and a typological division. This will be followed by a site selection procedure aimed at identifying test locations for coastal eutrophication assessment: this procedure will select both large and medium-sized systems, and consider coastal bayments and estuaries. A detailed assessment of the eutrophication status of the selected systems will be performed, including a comparison of different indices, typology adjustment and management outcomes. Finally, a proposal is developed for comprehensive Chinese coastal eutrophication assessment at the national scale. Preparatory discussions on this project were held in the Azores, Portugal, in November 2005. 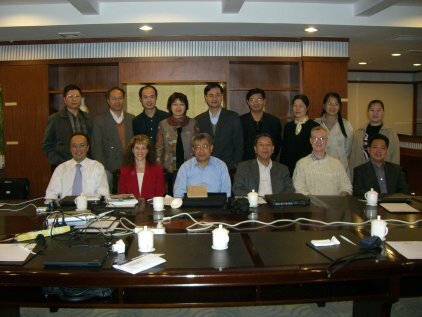 These were attended by FIO, Ningbo University, NOAA and IMAR. 6. Proposal for wider application.